You know what I mean, right? The kind of horror which isn't really scary, and even verges on comedy at times. Stuff like Giant Ants, Alien Blobs, Robots from Outer Space, and. . .THE THING CALLED KILLDOZER! Once again, part of the fun of these retro reviews for me is to not just read and review the comic at hand, but to try and learn a little bit about it in the process, and sharing a bit of my new knowledge if you don't mind indulging me a few paragraphs. . .
As you can see from the ridiculously awesome cover of this comic, it's based on a short story by Theodore Sturgeon that was written in 1944 and originally published in Astounding, a Science Fiction magazine. From what I've read, it was one of Sturgeon's most popular stories, although I have to confess I've never heard of it before this comic book. I guess I need to up my classic sci-fi reading game a bit. 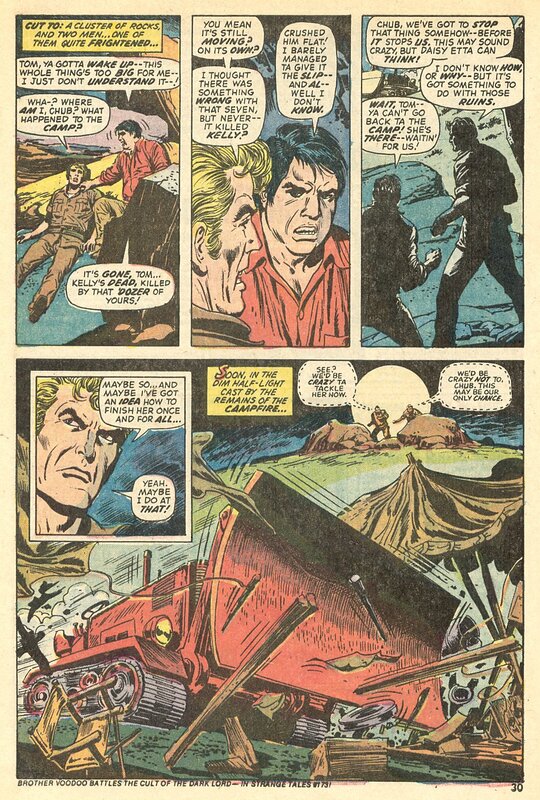 As you can ALSO see from the ridiculously awesome cover of this comic, there was a television adaptation of the story. It was an ABC Movie of The Week in February 1974. . .for younger readers, this was during the late dark ages of home entertainment when there were only 4 channels and you had to actually watch movies on T.V. when they were on or you just didn't get to see them. No DVR, no DVD, no Streaming. The Movie of The Week was sort of a big deal. If you want to enjoy a super-cheesy unintentionally funny "horror" B-Movie, Killdozer is available in all its full 70's glory entirety on Youtube. Check it out if you want a taste of some movie Longbox Junk! 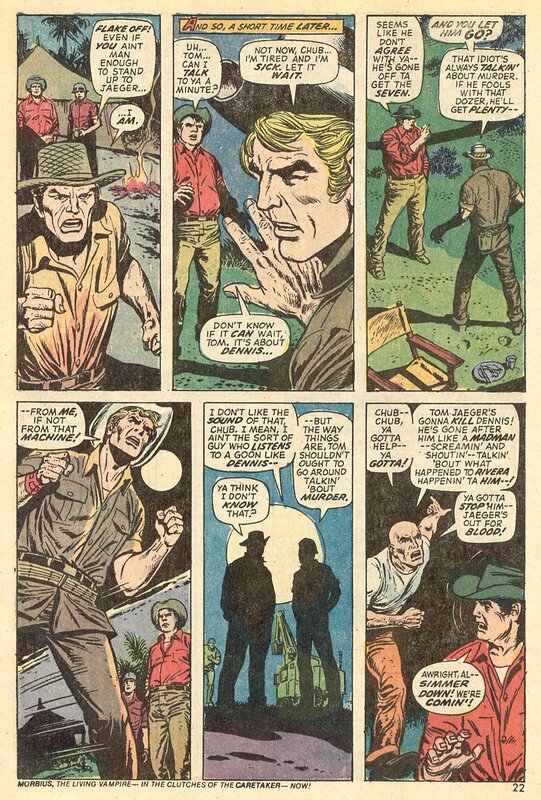 It's too bad there's no good way for a comic book to replicate the hilarious overacting of the T.V. movie (not that the writer didn't give it the old college try, but more on THAT below). The T.V. adaptation strays from the original source material in pretty significant ways, especially in the beginning and the end of the story. The comic version is closer to the original story (the beginning in particular), but has a different ending than either the original or the T.V. movie. There was also a band called Killdozer. I listened to some tracks and I'm probably safe in saying that unless you like your music yelled at you in an as loud and incomprehensible manner as possible, it's best to just leave Killdozer the band as an obscure late 80's/early 90's musical footnote where they belong. Enough of this. Let's get into the comic! First off. . .the cover. I bought this comic for the cover, and there are really only two words that can truly describe it: RIDICULOUSLY AWESOME. 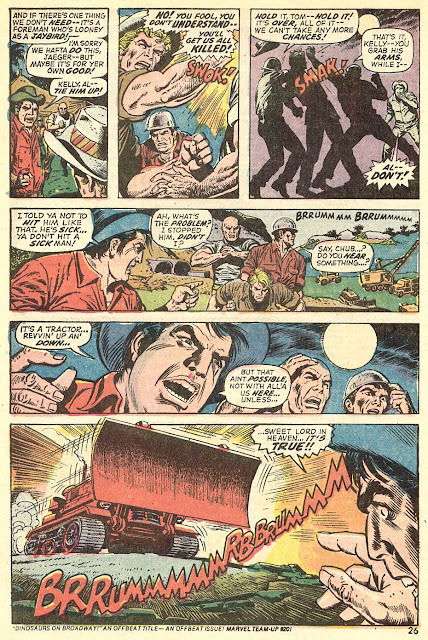 It's ridiculous. . .a living bulldozer with headlight "eyes" shouting at a guy in a disco-tastic green shirt? So bad. But at the same time, it's awesome. . .I mean, just look at it! The colors, the title, the menacing Killdozer. This is a cover that makes you WANT this comic! So good. Too bad it's pretty misleading. There are no women in the story, there's no shooting, and the Killdozer doesn't talk or look nearly as menacing. This is without a doubt one of the best AND worst comic book covers I have in my collection. I love it! It's Ridiculously Awesome! Moving along. 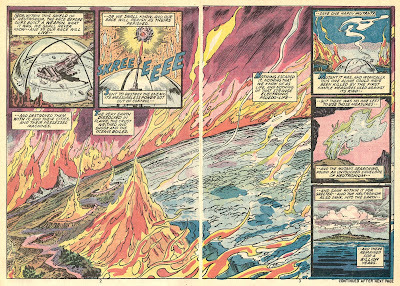 We start with a prologue explaining that a billion years ago, Earth was inhabited by an advanced race of humans, but they came under attack by strange sentient clouds of intelligent electrons that were able to turn any weapons or technology against its creators. Eventually, the human race was on the edge of extinction until they employed one final weapon that they were able to shield from their enemies. Unfortunately, it was a bit of a doomsday weapon and the Earth itself was almost destroyed. . .but the human race barely survived. A lone alien entity also survived, burying itself in the Earth and hiding safely undisturbed for a billion years. The movie just uses the old B-Movie standby of "A mysterious meteor from outer space with unknown radiation". A bit less epic than a massive war a billion years in the past ending with a burning Earth, but much more budget-friendly. Flash forward a billion years to the present day and a seven-man construction crew contracted to build an Air Force landing strip on an isolated island that looks a lot like the same island the mysterious electron entity hid itself under in the distant past. . .DUN-DUN-DUN! 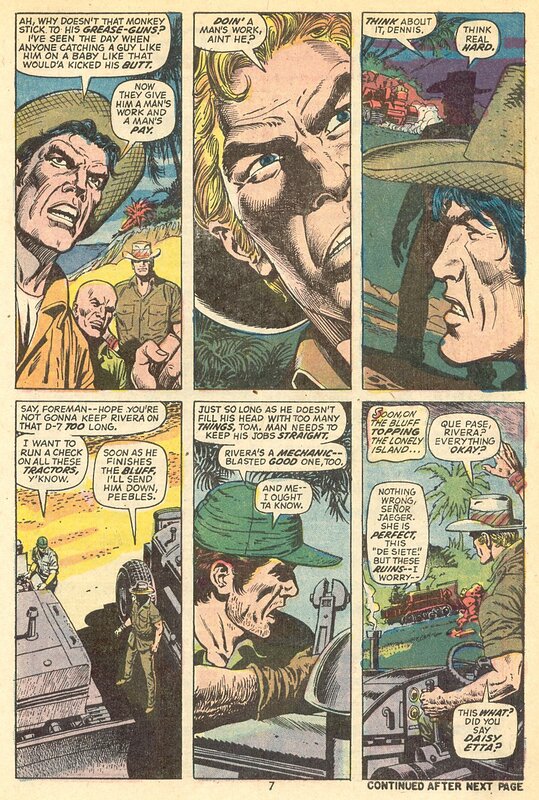 After a bit of casual 70's racism toward their hispanic mechanic/bulldozer operator, the crew gets right to work. Rivera (said hispanic mechanic and casual racism target) discovers some ruins and gets a strange feeling about them (DUN-DUN-DUN). The foreman of the crew (Tom Jaeger) isn't having any of Rivera's non-white superstitious nonsense and he doesn't give a damn about poindexter crap like archaeology (and HE'S the tolerant one, by the way), so he tells Rivera to bulldoze that old temple down. . .he's got an airstrip to build and by God, he's gonna build an airstrip! 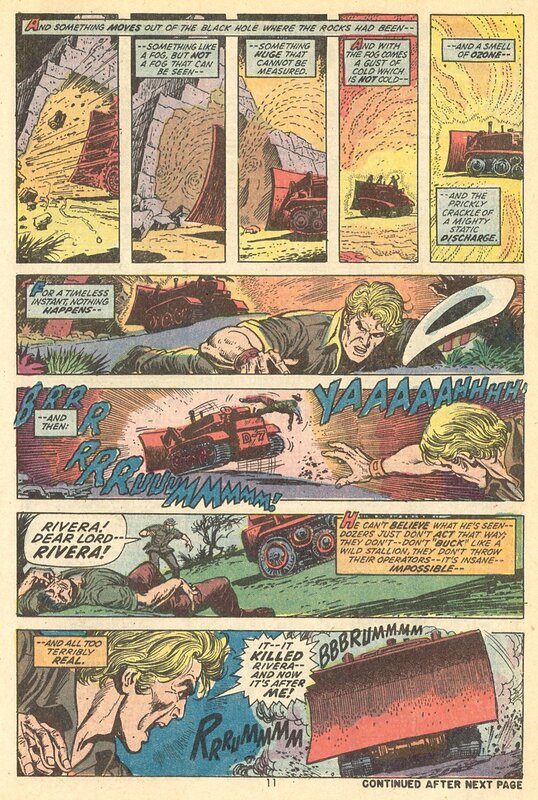 Rivera's fears are confirmed after he knocks a hole in the side of the ruins and a mysterious cold wind suddenly causes the bulldozer to start acting on its own. 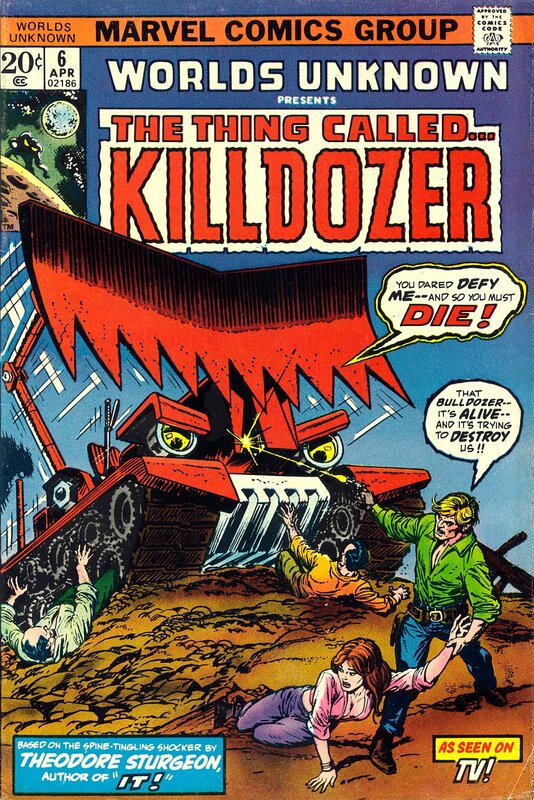 It throws off Rivera, killing him, and then comes after Jaeger. . .and so The Killdozer is born! Jaeger barely manages to escape and disable the bulldozer, but back at camp, the rest of the crew are having a hard time believing Jaeger's story because all the pieces don't fit right. After another man is killed (electrocuted while trying to restart the bulldozer) and Jaeger is once again the only witness, the whispers start turning into accusations. The accusations turn into full revolt as yet ANOTHER man is killed with Jaeger as the witness when the bulldozer runs him over. By the time Jaeger has witnessed three fatal "accidents" by the same machine, and narrowly escaped with his own life, the Foreman has figured out that there's something definitely wrong with the bulldozer. Unfortunately, the remaining crew members are convinced that they're trapped on an island with a homicidal maniac who is killing them off, and his insane ramblings about the bulldozer coming to life aren't changing their opinion. Luckily for Jaeger, his seemingly insane story is confirmed as the 3 remaining crew members try to take him down. The driverless bulldozer cruises right into their camp and starts revving its engine before it chooses a target and runs him down as the horrified men watch. As the Killdozer wreaks havoc and destroys their camp, Jaeger and one of his remaining crew hatch a wild plan to destroy the living machine before it kills them all. . .lure it into the water and then hit it with a shot of electricity from an arc welder. 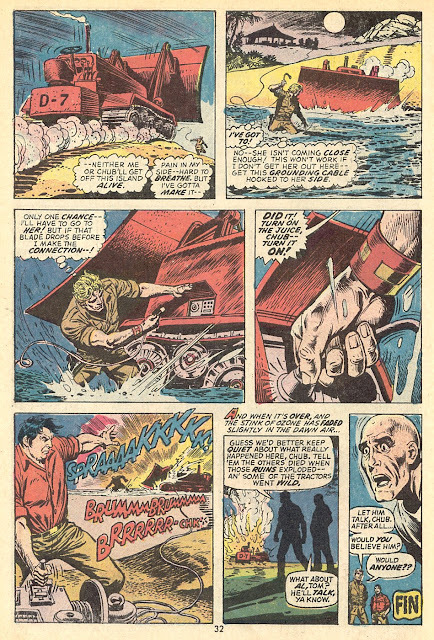 Using himself as bait, Jaeger manages to get the Killdozer to pursue him off the beach and into the water. His other crewman hits the juice and Killdozer is down! The plan worked and the three remaining crewmen are safe. . .but who's going to believe their story? What we have here is an extremely simple story that's basically a monster chasing and killing its victims until they manage to defeat it. It's a pretty well-worn kind of story that's been seen many, many times. To tell the truth, it's not nearly as exciting as that ridiculously awesome cover makes it seem like it should be. It's actually pretty straightforward and predictable. It's not that the story is bad. . .it isn't. It's just told in a somewhat flat way, considering that it's a tale of a bulldozer coming to life and killing people. The writer TRIES to bring some life to things by having a lot of shouting back and forth, but it all comes off as sort of trying too hard. The art is likewise pretty straightforward and predictable. 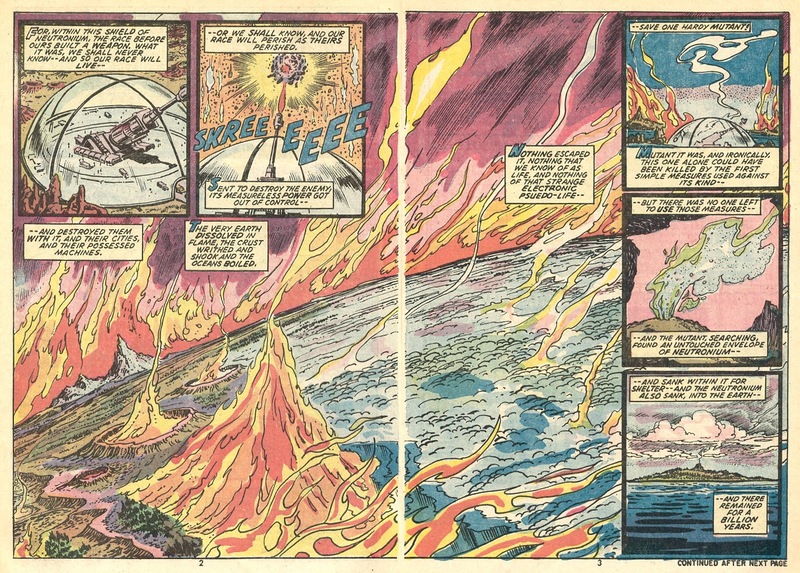 Except for the cover and a nice double-pager of the burning Earth during the prologue there aren't any panels that really stand out. The art isn't BAD at all. . .but it isn't really that good either. If I had to describe this comic in one word, that word would be: Workmanlike. The story is simple in a "this happened, and then this happened, and then this happened" sort of way. It moves from start to finish in a steady, predictable line. The art is also steady and predictable. It's not bad. . .it's not great. It just rides right down the middle line of telling the story, but not trying too hard to stand out in any way. Truthfully, the cover is the best part of this comic. The rest of it is just sort of. . .there. There's still a bit more Longbox Junk Halloween fun to be had! I have a vague memory of this, and may have even watched it, or else just remember hearing kids talk about it. It definitely made me think of the Stephen King short story "Trucks," which became the movie Maximum Overdrive. And I meant to tag on that King's story was probably influenced by Sturgeon's, just as King's "Children of the Corn" was influenced by Thomas Tryon's novel, Harvest Home. I see a lot of influence on Trucks/maximum Overdrive as well. Especially in the movie version of Killdozer, with its "Asteroid with unknown energy" opening. Thanks for reading! 1996 Wizard Magazine Christmas Tag Insert Hellboy Spawn Witchblade Bone Etc.